Quantification of structural resistance (capacity), or capacity of a structure under a broad range of loading conditions (structural demands) is a challenging problem, given the diversity of construction materials, structural systems and loading patterns a structure may have to experience over its lifetime. Modern structural engineering benefits from an expanding array of established and emerging technologies offering unprecedented opportunities for creativity and innovation under the increasingly generic label of "performance-based engineering". Structural stability and buckling, inelastic analysis, fatigue, plates and shells, numerical simulation, finite element modelling and analysis. Cold-formed thin-walled members (tubular, open-section, perforated), advanced steel materials (stainless steel, high-strength steel), steel materials at elevated temperatures and post-fire condition, tubular structures and welded connections. Reinforcing systems for regular/high-performance concrete structures, sustainable concrete materials, reinforcement corrosion, concrete structures under dynamic loading, condition assessment (NDT) and structural health monitoring, forensic engineering. Impact dynamics, blast loading, armour and protection systems (metals, concrete, composites, cellular materials), earthquake analysis and design, structural robustness against extreme conditions. Analysis and integrity of critical components (tanks, vessels, piping, pipelines), offshore structures and pipelines, offshore platforms for renewable energy, condition assessment of “aging infrastructure”. Advanced composite materials (e.g. FRP, textile reinforced mortars) for strengthening/rehabilitation of damaged or deficient structural elements, and for new construction applications: FRP reinforcement of concrete, all-FRP structures, and polymer composite structures for renewable energy (e.g. 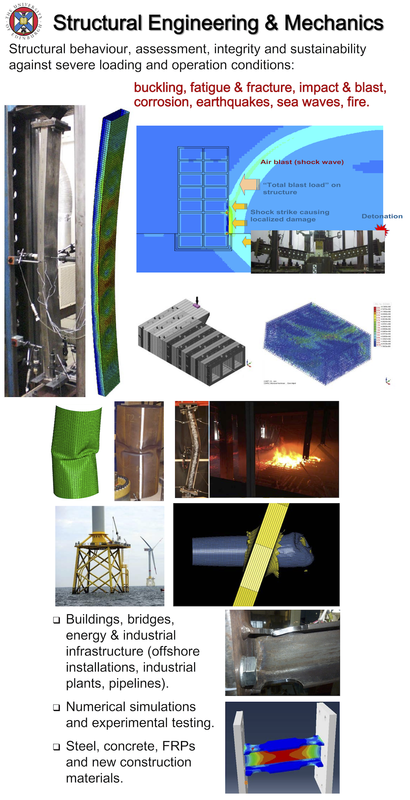 tidal and wind turbines); polymer adhesive joints; structures made of hybrid and innovative materials. Structural analysis and design accounting for thermal/mechanical fire effects on construction materials and structures (steel, concrete, timber, FRP, and composite construction); experimental and computational work; multi-scale approach: from micro scale to full structural frame.